Jean Van de Velde looks at his ball helplessly on the 18th hole during the 1999 British Open. Walter Hagen once said, "No one remembers who came in second." In most cases, that might be true, but the 1999 Open Championship at Carnoustie was not most cases. Paul Lawrie won that year’s Open in record fashion, coming from 10 strokes back on Sunday to claim his first and only major title. However, if you ask about the 1999 Open at Carnoustie, Lawrie’s is not the name that comes up. Instead, people talk about the man who finished second: Jean Van de Velde. The now-infamous Frenchman, Van de Velde entered the final round with a five-shot lead and was the only man in the field at par or better. His closest pursuers were Justin Leonard and Craig Parry. During the round, Van de Velde struggled early, falling to 4-over at one point and briefly losing the lead to Parry. Van de Velde’s shoddy play also allowed Angel Cabrera and Lawrie to creep into the picture with roughly six holes to go. By the end of the round, however, Van de Velde had re-built a three-shot lead. Coming to the 18th tee at plus-3 for the tournament, Van de Velde could make double-bogey and still win the Open Championship. Van de Velde hit a daring tee shot, taking driver and pushing the limits, hitting his ball onto a peninsula over on the 17th hole, stopping just short of falling into the Barry Burn river. With 185 yards left and five shots to make it in, Van de Velde did the unthinkable, fanning a 2-iron right. The shot clanked off a stadium railing, off the rock wall guarding Barry Burn and into some of the thickest rough on the course. From there, Van de Velde chunked his third shot into Barry Burn; after flirting with it twice, Van de Velde finally ended up in the water. Following the shot, he famously took his shoes and socks off, rolled up his pant legs and debated hitting the next shot out of the river. Commentator and two-time U.S. Open champion Curtis Strange said during the telecast, "You hate to be harsh on somebody, but this is one of the most stupid things I’ve ever seen in my life. I have to be honest." Van de Velde thought better of hitting out of the water, but the shot that followed wasn’t much better than the previous three. After taking his drop, Van de Velde hit his fifth shot into a greenside bunker. He would need to hole out to win, or get up and down for a playoff. Van de Velde would made seven, sneaking into a playoff with Leonard, the 1997 Open champion, and Lawrie. The collapse took close to a half an hour to play out. Yet it wasn’t really complete until the Frenchman again struggled during the four-hole aggregate playoff. He and Leonard lost to Lawrie by three strokes. After the tournament, Van de Velde was graceful, if not self-deprecating in his interviews. "It’s sad, it’s very sad … can I go back and play it again, actually? That’d be nice," he said. 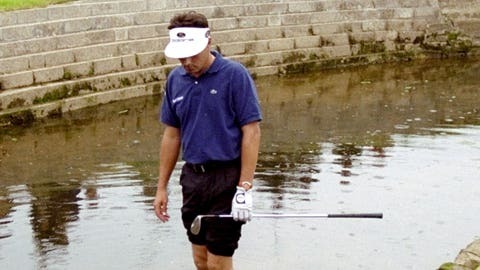 Jean Van De Velde puts his shoes back on after stepping into the water on the 18th hole of the 1999 British Open. By then, he had already lost his footing. "You have to remember, putting in perspective, it’s a game … it’s a game," Van de Velde said. "It’s not, you know, like life and death or whatever. It’s your name down on a trophy." Despite Van de Velde’s brave face, Jimmy Roberts said during a segment on ESPN’s SportsCenter that the golfer was "crying uncontrollably in the locker room" before the interview. Shortly after the tournament, Van de Velde was asked, "How long do you suppose this will haunt you?" "I guess forever," he said. "But … who will remember in 100 years?" No one knows whether Van de Velde’s collapse will still be remembered as vividly 85 years from now as it is 15 years from when it happened. What we do know is that the man who lived it doesn’t outwardly seem to be haunted by the loss, despite the fact that his name has become synonymous with late-round collapses and colossal mistakes. ESPN’s Tom Rinaldi sat down with Van de Velde in 2007 when the Open Championship returned to Carnoustie. He asked Van de Velde why he thought people still wanted to talk about his collapse on the 18th hole. "I think because they’ve all done it once or twice," Van de Velde said. "At the end of the day, you stand back and say, ‘Well, this is where it slipped away from me.’"
Before he even struck his final tee shot during that final round, people were second-guessing his decision making on the hole. To this day, however, Van de Velde does not. 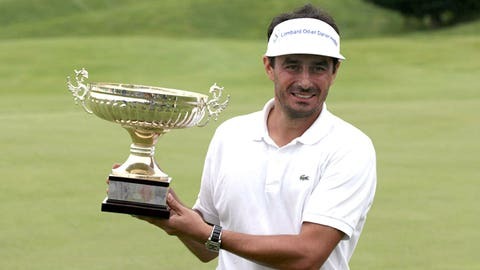 Jean Van de Velde in happier times after winning the 2006 Madeira Island Open. "What do you want me to say? I should have played it differently? I believe that, you know, with what I do and the way that I do it, day in, day out … that I played it correctly." 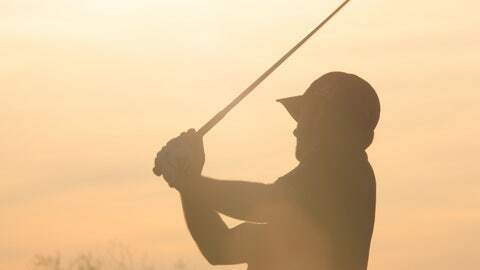 Stay on course with this season's pro golf schedules. How can a man who came so close to winning one of the greatest prizes in golf, so close to actually having his name on the trophy and then having it scrubbed off, continue on and believe that he truly "lost nothing" in 1999? By sticking to his beliefs and believing that he did the best he could. "I hope that people learned that it’s a game and there’s bigger things," Van de Velde said. "Winning with grace is pretty easy. Losing with it is a lot harder."